With a face of joy, excitement and with a most striking smile, she glides on her brand new moccasins. Her petite size 6 feet fit the brand new moccasins magnificently and absolutely perfect. The moccasins are a dark tan color with beautiful fringe hanging down the sides and going all the way around the top of them. The tops of the moccasins are also accented with beautiful beadwork that gives the moccasins a hint of elegance. Inside of the moccasins is soft warm fur from a rabbit. “Wow, they fit my foot just like a warm pair of gloves”. 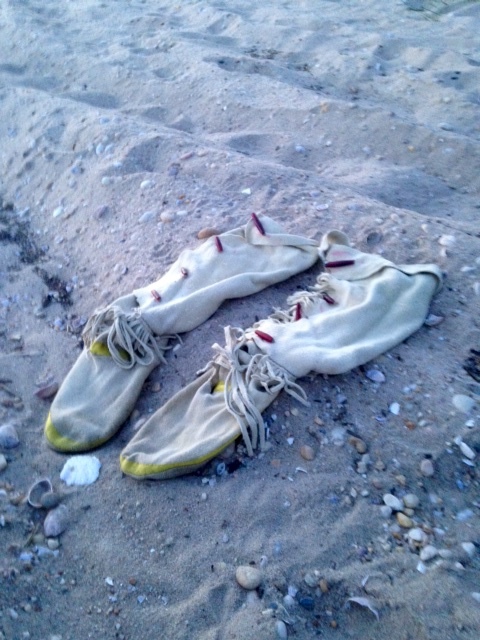 As she stands to take a few steps, the moccasins make her feel as if she were walking on clouds. “Thank you Meema.” Meema is Sparrow Whitecloud’s grandmother. Sparrow Whitecloud is a young Native princess just about to come upon her 13th birthday in a few days. Her Meema has made her a brand new pair of moccasins for her birthday and because of how much Sparrow has grown in just a year. “You know Sparrow, if you keep growing at this rate, you will have to finally learn how to make your own moccasins soon.” Sparrow smirks and says, “I promise Meema to learn how to make my very own moccasins before it’s too late. I am just glad to get rid of my old muddy moccasins.” As Sparrow sets her old dilapidated moccasins off to the side, she starts to tinker around with her brand new moccasins. During this time also, Sparrow’s Meema begins to put away all of her sewing materials. She puts away the raw Hyde and her beading needles in a safe place. Sewing is not just a craft for Meema; it is a passion of hers as well. She takes much pride in her work mostly because of what has been passed down to her by her elders and family. As Meema thinks about the comment that Sparrow has just made about her old moccasins, she sees this as an opportunity to pass down some of the wisdom from her ancestors to her granddaughter. After putting away all of the sewing materials and cleaning up, Meema begins to put a huge pot on the stove in preparation to make a bit of venison stew. Once the ingredients are put together in enticing arrangements of deliciousness, Sparrow walks into the kitchen being mesmerized by the smell. “What are you cooking Meema?” asked Sparrow. “I am putting together some stew for supper and it should be ready in a couple of hours.” “Well I can’t wait to have some Meema because I am so hungry and my brand new moccasins are making me feel like a new person says Sparrow as she is dancing around gazing at the boiling pot on the stove. As Meema looks up at Sparrow still dancing and smiling in her new moccasins, Meema asks, Excuse me young lady, but where are your moccasins?” Coming to a screeching halt, she responds by saying, “I put them in a bag to put in the trash later on today.” With a disappointed look on her face Meema says to Sparrow, “Absolutely not! I want you to go and get your moccasins and meet me in the other room for a talk.” Then as Sparrow walks away in search of her moccasins, she is confused and upset because clearly she has troubled her Meema.